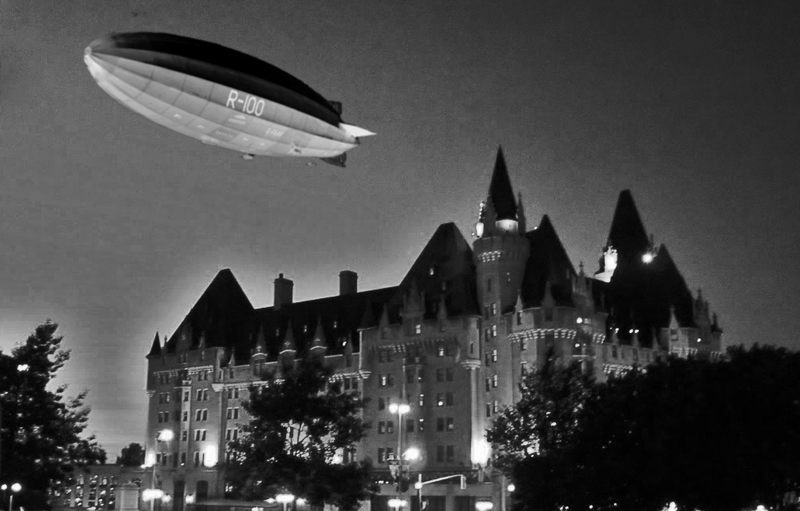 How the R100 may have looked as it hovered over the Chateau Laurier on the night of August 10 1930. One summer’s eve in 1930, the warm night air became filled with the roar of engines as a colossal object hovered over the downtown Ottawa skyline. Cars stopped in their tracks, thousands of people ran from their homes, restaurants and movie theatres, staring skywards at a massive shape that was slowly filling the night sky…it was the Night Of The Zeppelin. 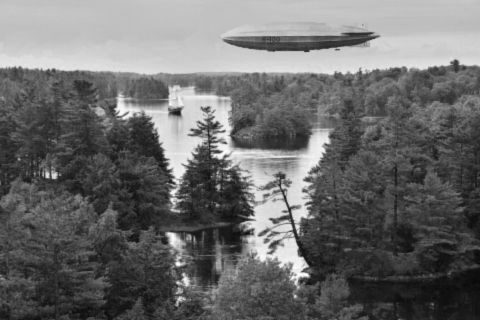 The age of the mighty airship arrived in Canada in the summer of 1930 when the newly constructed R100 completed its maiden voyage across the Atlantic Ocean from Britain to Montreal. Built as part of the Imperial Airship scheme to have a fleet of giant airships that could reach all corners of the British Empire around the globe, the 720 foot R100 was powered by six V12 Rolls Royce Condor engines housed in three gondolas. Each gondola contained two engines, one for pushing and one for pulling propulsion to give the R100 a maximum speed of 80mph or 130kmh. Constructed of a lightweight aluminum rigid airframe and filled with hydrogen gasbags, the outer skin of the R100 was made of an aluminum dope coated linen. 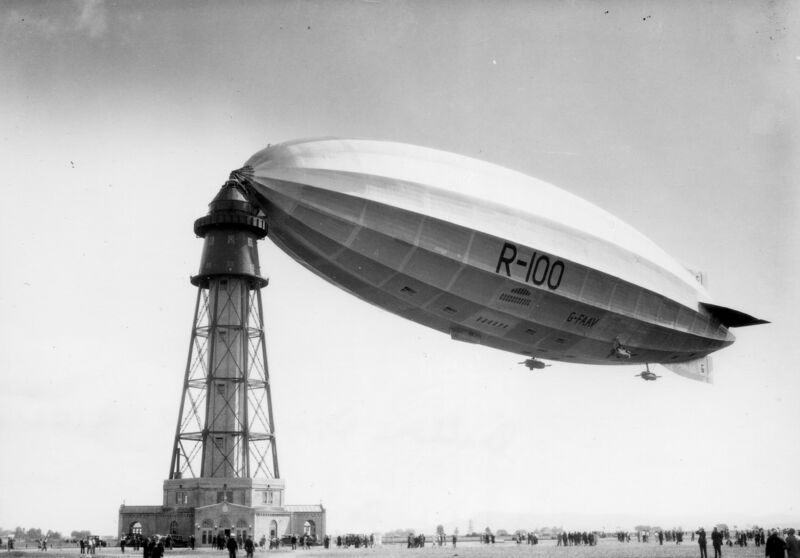 Completed in 1929, the R100 made a number of test flights before it was decided Her Majesty’s Airship would prove her airworthiness to the world by completing a trans-Atlantic journey to Canada in 1930. Two years earlier the Germans had successfully crossed the Atlantic to the United States in their Graf Zeppelin, and now it was Britain’s turn. Size comparison showing how large the Zeppelins were compared to modern day jet airliners. With a crew of 37 and a passenger capacity of 100 guests, accommodation was arranged on three decks inside the ship. The first decks were crew quarters, the second deck housed the dining room, which doubled as the passenger lounge, plus the kitchen, 18 four-berth passenger cabins and a gallery on either side for passengers to enjoy the view through the windows built into the skin. 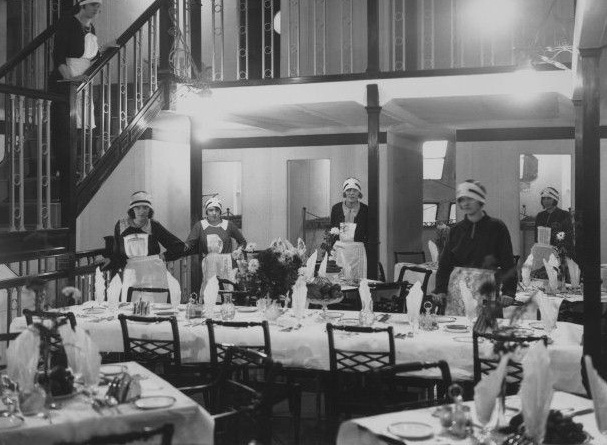 The third deck consisted of a gallery running around the dining-room and 14 two-berth cabins. The R100 dining room and staff ready to make your Zeppelin voyage an enjoyable one. After leaving England on July 29 1930, the R100 successfully crossed the Atlantic and arrived in Montreal in just 78 hours at an average speed of 68kmh. A special mooring 200 foot Art Deco mast was built specifically for the giant airship’s arrival, the only one of its kind in the world outside of England. Docking at the new mooring mast at an airfield in St. Hubert, over 100,000 people a day rushed to view the future in Zeppelin transportation. 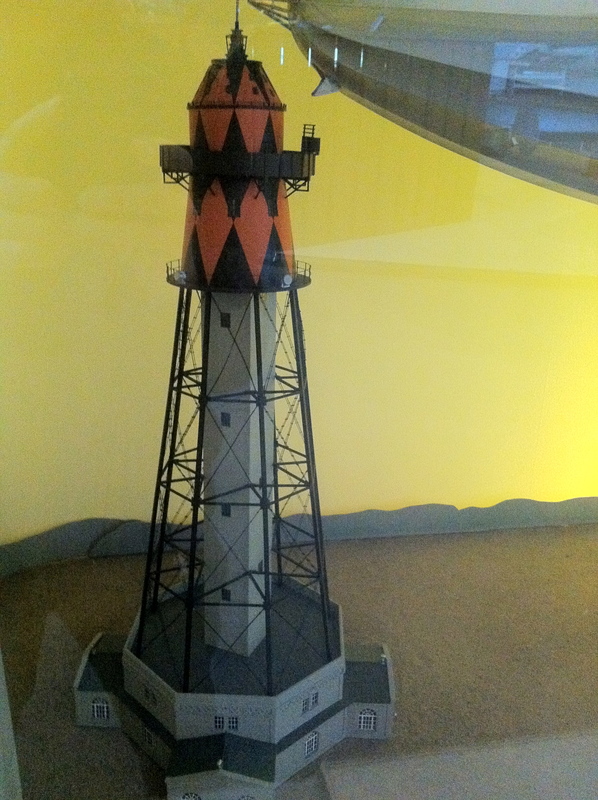 The specially built mooring mast tower for the R100 at St. Hubert airfield just outside Montreal. 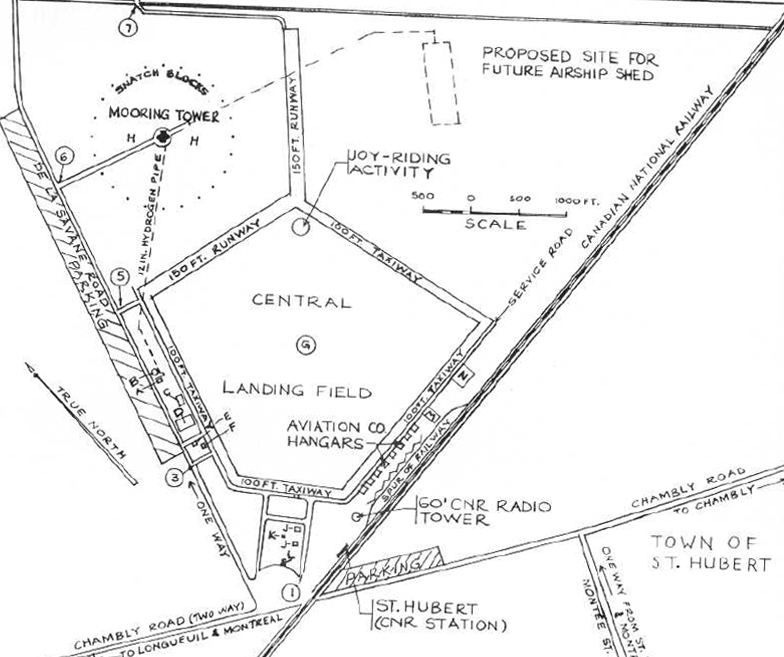 Original map showing the St. Hubert airfield with the location of the airship mooring mast and hopeful future hanger. 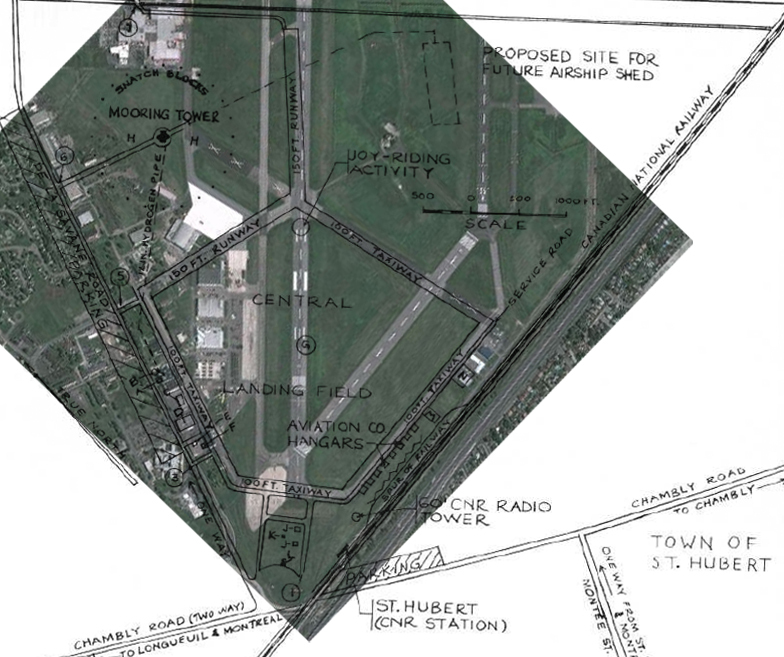 The same map overlaid on a current map of the St. Hubert airport. Note the tower has since been demolished. Location as it looks today of where the airship mooring mast would have been located. 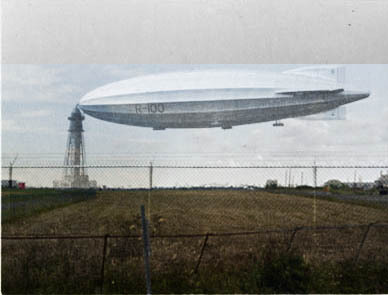 Long since destroyed, a composite image showing the R100 and the mooring tower ghosted over the same view today. 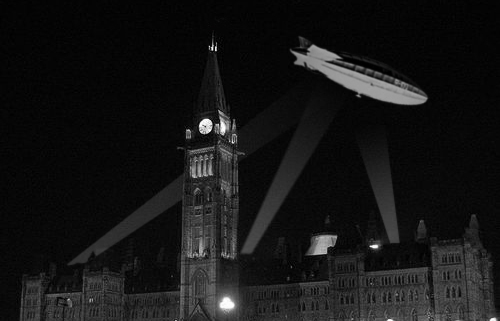 Rendition of how the R100 may have looked hovering over the Parliament Buildings with searchlights on it as it passed over Ottawa August 10 1930. Continuing its silent passage through the night skies, the R100 reached Toronto at 5am the next day, passing over St. Catherine’s and even Niagara Falls. It made a brief appearance over the Thousand Islands and into New York State, before making the necessary preparations for a return to England. 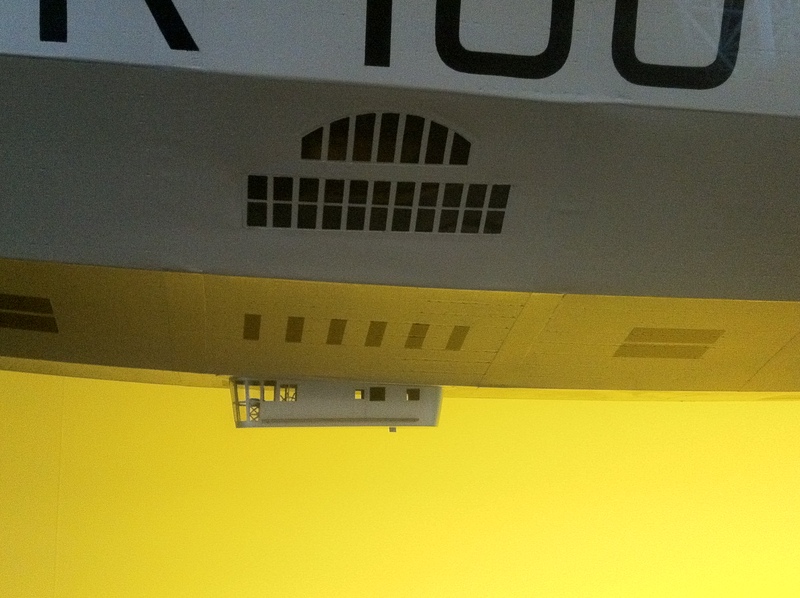 Guests aboard the R100 would enjoy the finest in airship travel, as seen here in the lounge. 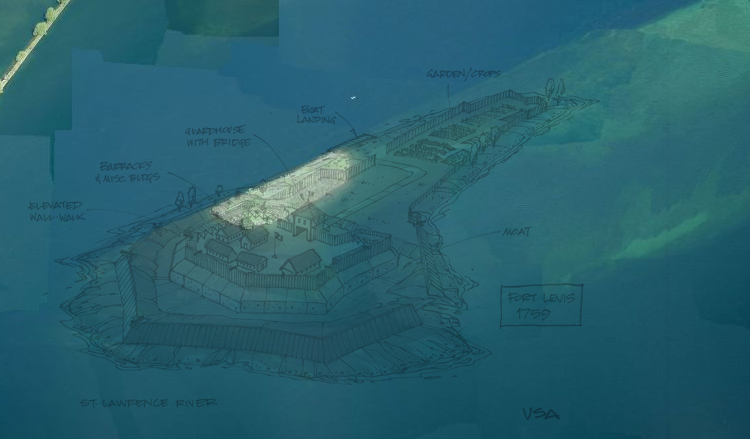 Rendition of how the R100 may have looked crossing over the Thousand Islands. After a successful return flight across the Atlantic back to its base in Cardington, the British Air Ministry was confident their airships were ready to travel the world. The R100 had a sister ship the R101, that was outfitted with heavier, but safer diesel burning engines geared for tropical travel. Orders were given to send the R101 to India, to show the world they were the new Zeppelin masters of the world and that the Imperial Fleet was capable of reaching any destination they choose. Unfortunately, the hasty and over confident orders resulted in disaster. Just weeks after the R100 arrived safely back in England, the R101 left for India outfitted with its heavier diesel engines, but soon faced a violent storm over northern France and for reasons unknown, hit the ground, igniting its volatile hydrogen gas, exploding into a ball of flames killing 48 of the 54 people aboard. Humiliated and now unsure of the great Imperial Airship Fleet, the British Air Ministry ordered the remaining R100 grounded. After a year of contemplation it was decided the age of the airship was over for the British Empire, and in 1931, the once majestic symbol of a new era in aeronautics was pulled from her hanger in Cardington into a field where it was unceremoniously destroyed, flattened by a steam roller into a pile of aluminum that was later sold for the scrap metal value of around $1,200. 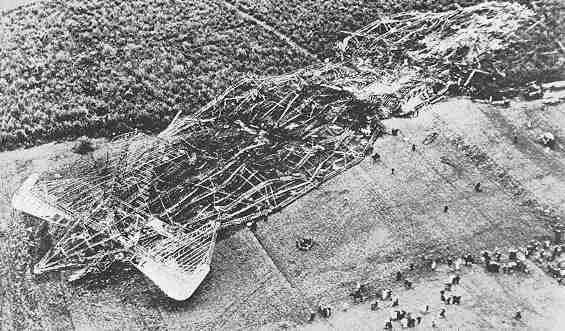 The R101 destroyed after its fiery crash in France just weeks after the R100’s successful voyage to Canada. Hoping other countries like Germany and the United States would bring their continuing airship programs to Montreal, the St. Hubert airfield maintained their Art Deco mooring mast, expecting one day a visiting airship would once again return. No other airship ever returned to Canadian skies, and now just a sad reminder of a once romantic period in aeronautics, the airport demolished the 200 foot tower in 1938, bringing an end to the age of the airship in Canada. All that remains of the R100 today are few items on display in the Aviation & Space Museum in Ottawa, including the original control steering wheel, a bed frame, and a fragment of its outer linen covering. 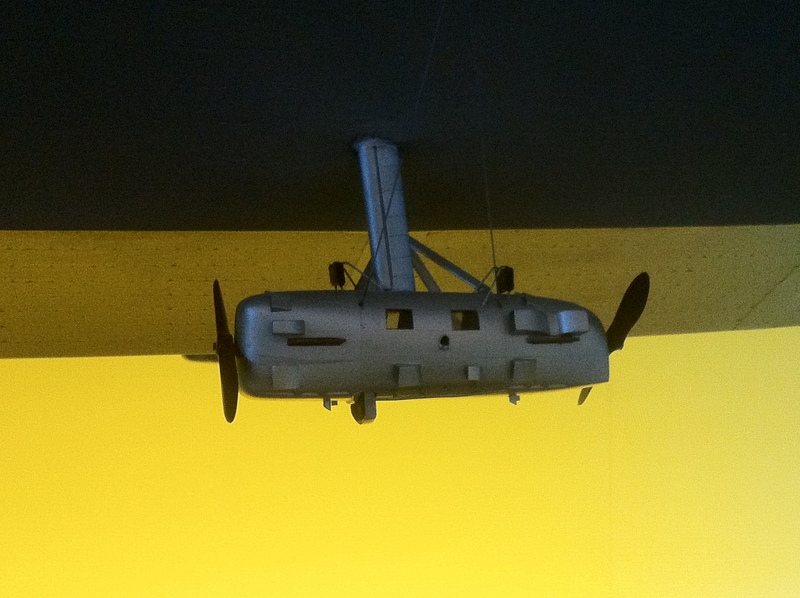 Some other components and the original airship hangers remain in Cardington, England. 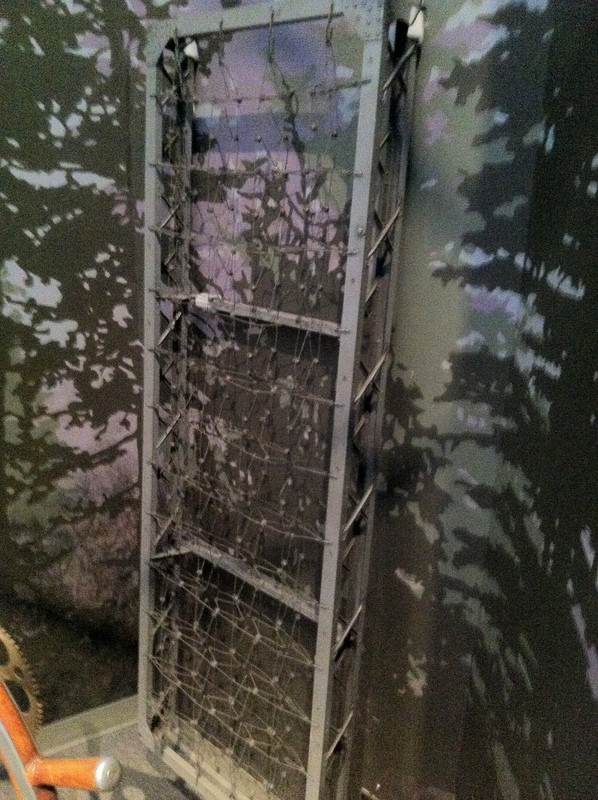 A lightweight aluminium bed frame from the R100 airship on display at the Aviation Museum. 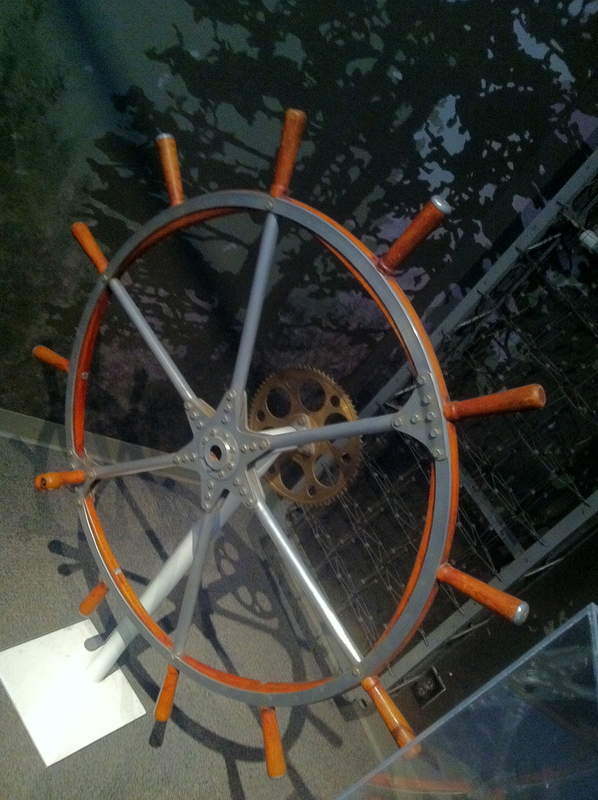 One of the original R100 control steering wheels on display at the Aviation Museum. 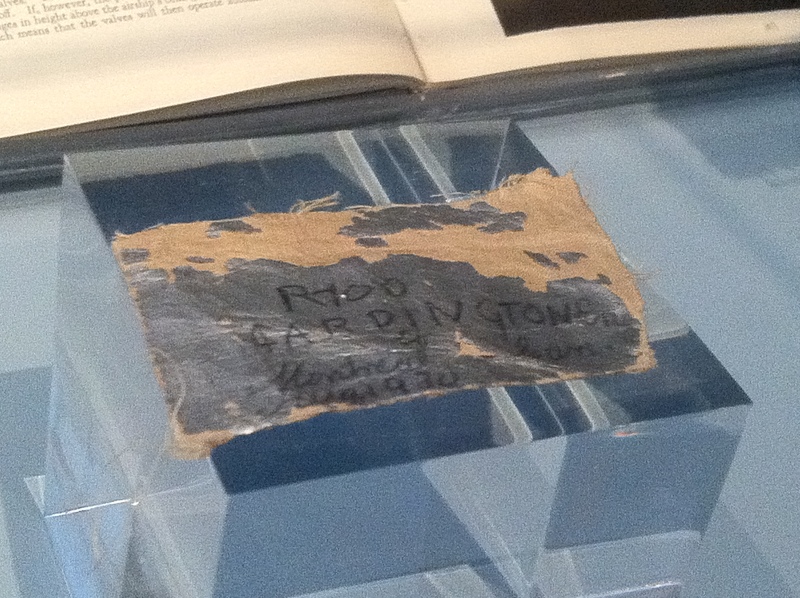 Fragment of linen covering from the R100 at the Aviation Museum. A sketch of Hartwells Locks as it may have appeared in 1845. 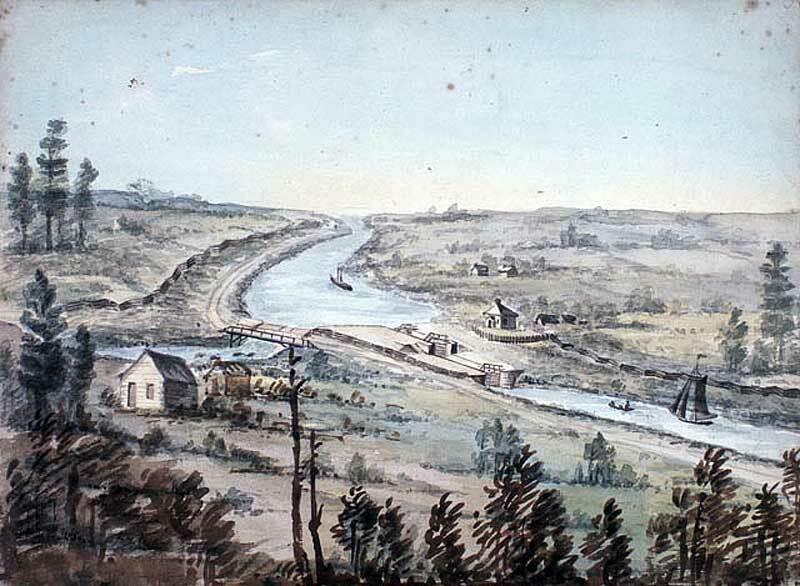 During the construction of the Rideau Canal from Ottawa to Kingston in 1826-1832, thousands of workers employed by the British to build this massive feat of engineering were paid in Yankee Silver Half Dollars, part of the war indemnity paid by the United States to Great Britain after the War of 1812. This money was sent to the canal district in kegs from Montreal. These vast amounts of silver coins were transported in barrels to paymasters cabins along the canal route, one being at Jones Falls, another at Smiths Falls, and another one at Hartwells Locks. Hartwells Locks lies just on the southern end of Dow’s Lake in Ottawa near Carleton University. The paymasters cabins were storage facilities and dispensaries for wages, and due to some “untrustworthy” men among the ranks of the paymasters and those that delivered the silver, coins mysteriously vanished and were apparently buried to be recovered later by the persons who hid them. This legend was substantiated by a retiring Hartwells lockmaster in 1953, Alan Moses, who claimed “a great deal of money was stolen from the paymasters house, an old log cabin across the canal from the lockmasters house”. He claimed he was going to find the lost silver after his retirement from the locks. No one knows if he ever found the silver or if it lies there still waiting to be discovered. 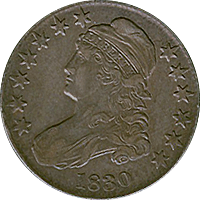 Currently a single Yankee Half Dollar from the 1820s is worth about $200-$600 and contains 90% pure silver. 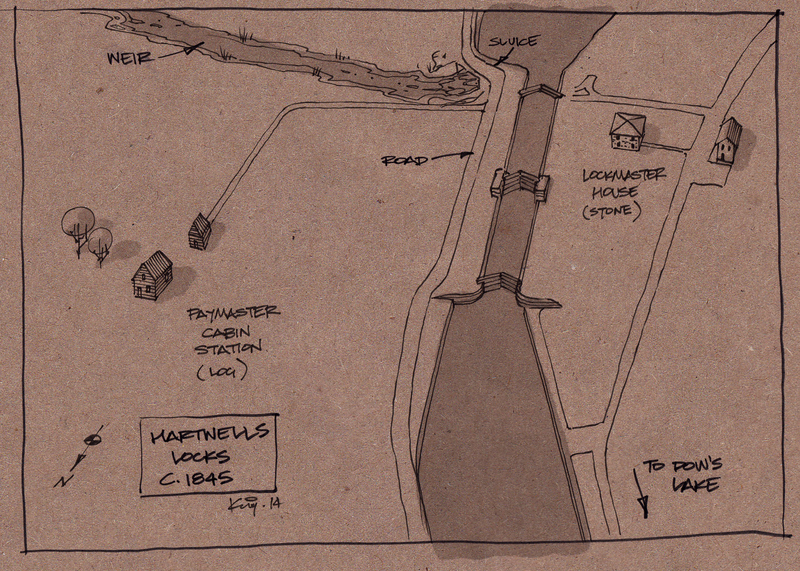 A sketch of Hartwells Locks from 1845 showing the paymaster cabins in the foreground, across the canal from the lockmaster’s house. Using an old sketch painting of the area from 1845 that shows the lockmasters house and the paymaster cabins, I was able to sketch out how the area may have looked in 1845 compared to a present day Bing Maps aerial image. You can see where the Paymaster cabins would have been and what is there now. It seems the Engineering Buildings of the University have since covered the area and a new building has been constructed nearby. It is unclear if any archeological discoveries were made during the excavation of these buildings. 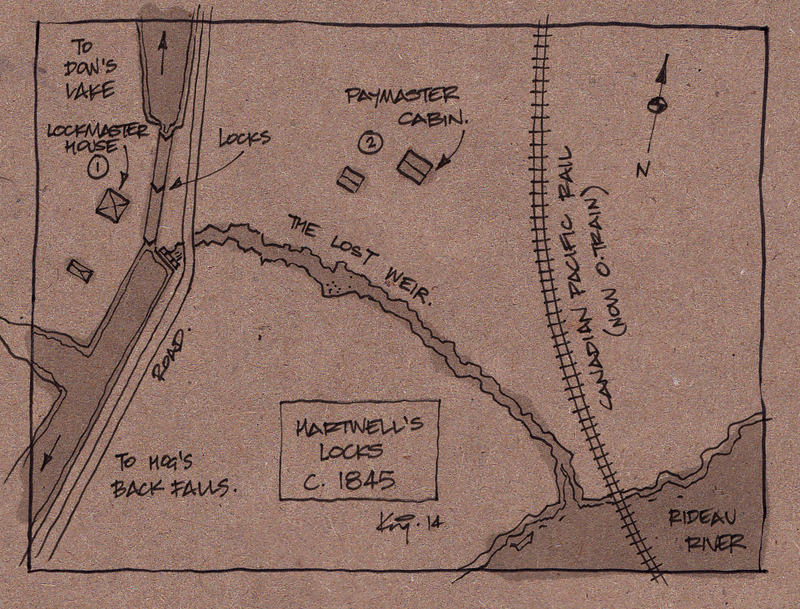 Composite map of Hartwells area showing the original paymaster cabins and what is there now. The Lockmaster’s house, which still stands at Hartwells Locks, is one of the oldest buildings in Ottawa and is a concealed fortress structure. Built around 1826 when the canal started construction, this two story building was made out of stone as a defensive structure to protect the locks in case of attack. The stone fort was later covered in clapboard siding to protect it from the elements and is how it looks today. Original stone Lockmaster’s House now covered in clapboard siding. 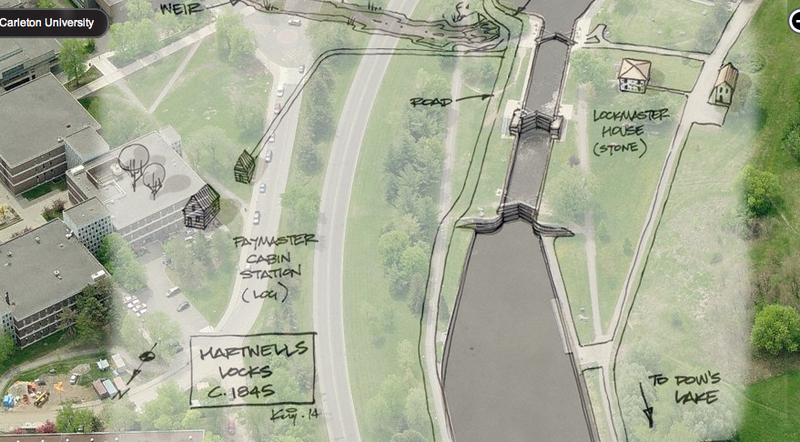 Along with the tales of the buried silver dollars and a concealed stone fort, Hartwells Locks also had a bywash to carry overflow water to the Rideau River across what is now Carleton University. Originally built as a weir to carry water out of the locks during operation, the channel was an open creek that cut across the land to the east of the locks and emptied into the nearby river. Map sketch of the area in 1845. Note bywash weir. 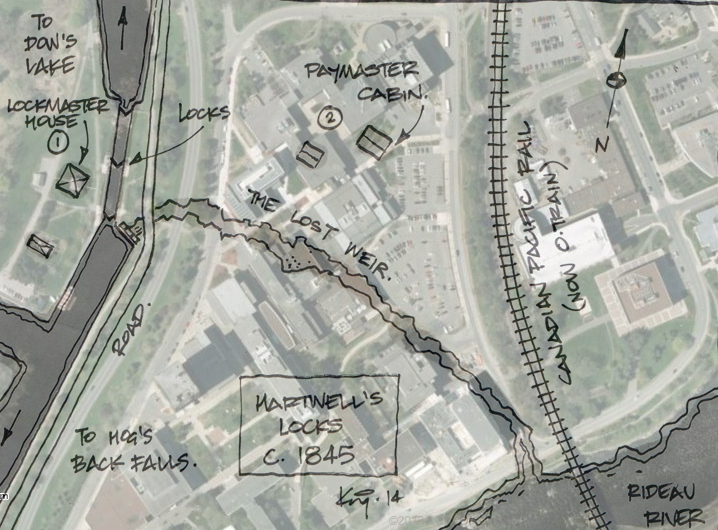 “Ghost” map showing the original 1845 map and a current aerial map. A sluice gate was used at the side of the locks that regulated the weir waters, and is still visible to this day. The open weir was still in operation into the 1950s but was later adapted to run underground and diverted with culverts when the campus of Carleton University took over and developed the land in the early 1960s. Original sluice gate as it looks today that connects to the now underground weir. Does the lost silver of Hartwells locks still lie underground waiting to be uncovered or did the retired lockmaster find it and quietly retire to a villa in the Bahamas with what he found? Whatever the case, there is still the concealed stone fort and an underground channel that remains a hidden reminder of the fascinating canal history of the area known as Hartwells Locks. The Nation’s Capital contains some of the most stunning architecture in the country, most notably the Parliament Buildings. These prominent structures were designed by an architect by the name of Thomas Fuller. In studying Fuller’s work and his buildings, there is a recurring theme and design style that I believe are reminiscent of another style of architecture..that of The Knights Templar. A Templar knight with the distinctive cross on the tunic. Formed in 1120, the Knights Templar were created to protect pilgrims to the Holy Land of Jerusalem. It began with nine knights, but quickly grew under the order of the King of France and the Pope of that time. They built their domed headquarters on what was supposedly the ruins of King Solomon’s temple in Jerusalem, forming their name the Knights of the Temple or “Knights Templar”. The original Knights Templar domed headquarters in Jerusalem. 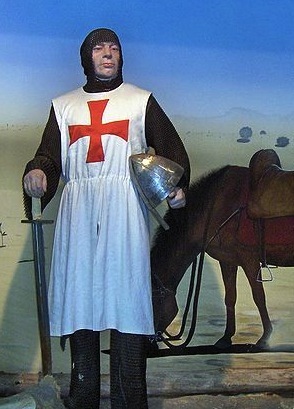 Templar knights, in their distinctive white cloaks with a red cross were among the most skilled fighting units of the Crusades and the non-combatant Templars managed a large economic infrastructure throughout Christendom, innovating financial techniques that were an early form of banking and building fortifications and churches across the Holy Land. 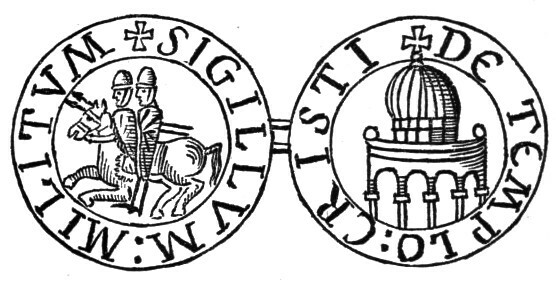 The original seal of the Knights Templar. The domed Temple on right. When the Crusades ended and the Holy Land they were sworn to protect was lost, the Knights Templar fell under suspicion by the King and the Pope of that time, the two figures who created the order in the first place. By 1307 mistrust of the Knights grew based on the Knights odd initiation rites and “un-Christian Practices”. King Philip IV of France and Pope Clement soon had the Knights Templar arrested, tortured then burned at the stake. On Friday the 13th of October 1307, many Knights Templar were rounded up and executed by the King under orders of the Pope. This is a popular reason Friday The 13th is regarded as an “unlucky day”. 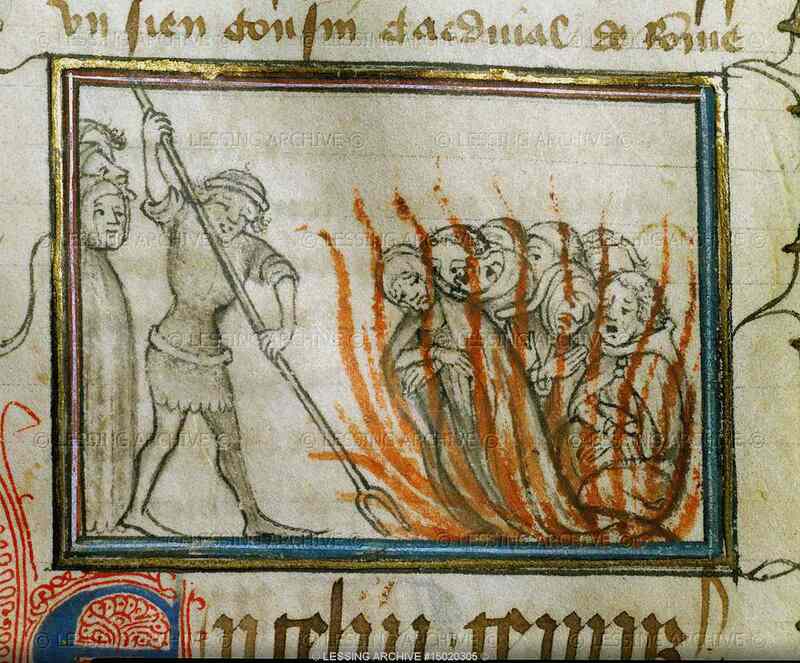 Knights Templar being burned at the stake on Friday the 13th 1307. Escaping persecution, hundreds of remaining Knights Templar knew that their fate was sealed and began to pack up their hordes of treasures, including what many believe to be the Holy Grail and other religious relics and loaded them onto a fleet of ships in the Mediterranean. The Templar ships left at midnight from La Rochelle, France and reportedly headed to where they were given asylum and refuge: Scotland. It seems Robert The Bruce of Scotland gave the Knights Templar refuge in his land, having been excommunicated by the same Pope a year before the Templars were persecuted. Unloading men, treasures, and wealth into Scotland, the Knights went into hiding, taking their secrets and their myriad of skills with them. 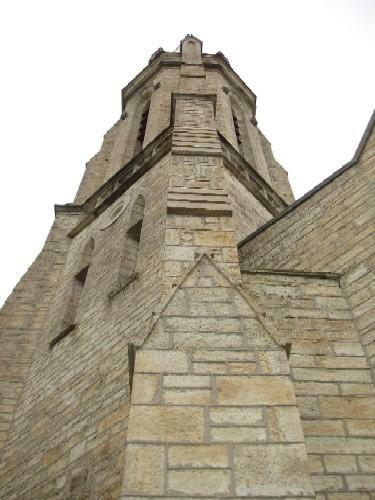 Their advanced skills in masonry, architecture and design can be seen in various church structures throughout England and Scotland to this day. 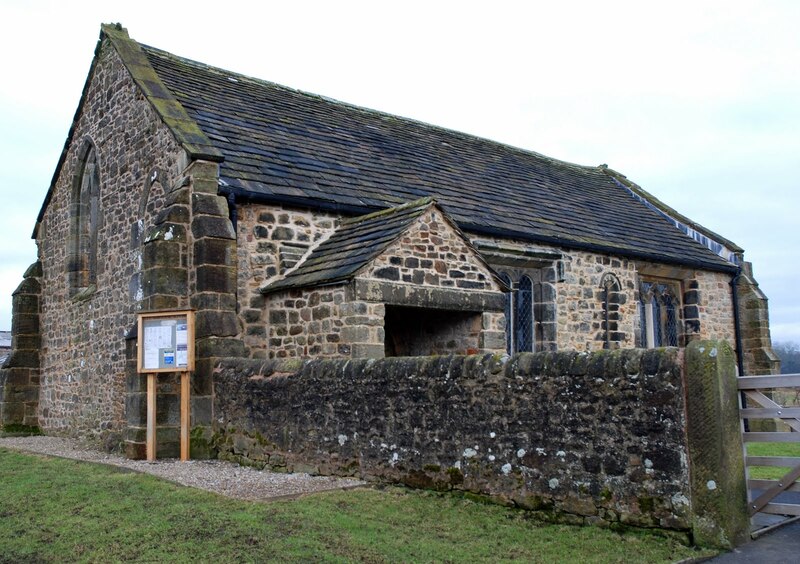 A medieval Templar church in the United Kingdom. After almost 500 years of hiding from the Catholic Church, the order of the Knights Templar was resurrected in 1790 by Alexander Deuchar in Scotland under a new name: Freemasonry. Since at least the 18th century Freemasons have incorporated Templar symbols and rituals. The Freemasons have five separated degrees or orders: The Entered Apprentice, The Fellowcraft, The Master Mason, The Royal Arch and finally: The Knights Templar. 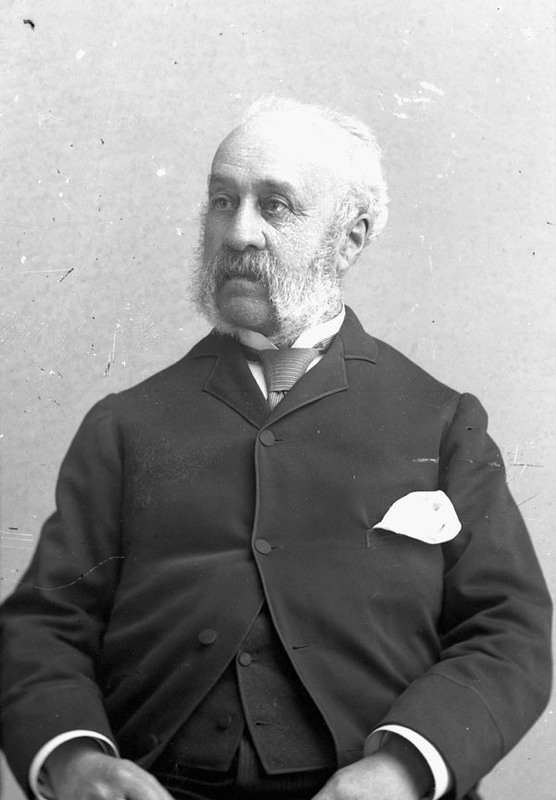 Thomas Fuller, architect of Canada’s Parliament Buildings and numerous churches in the Ottawa area. Freemasonry began to grow with prominent men of society from the 1800’s onwards, and our architect Thomas Fuller was most definitely associated with them. Fuller was born in England and came to Canada in 1857 to set up an architecture firm specializing in stone buildings. Two years later he became Canada’s most important and large scale architect of some of our area’s most important buildings. The Fuller list of buildings he designed is extensive and all seem to be contracted in a short span of 15 years between 1860 and 1875 and all have some kind of Freemasonry association. Fuller’s Library Of Parliament under construction 1860s. 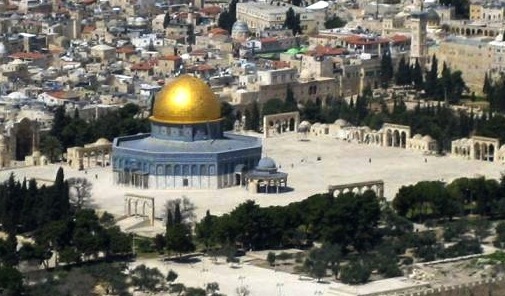 Note dome similar to original Templar headquarters at the Solomon Temple. 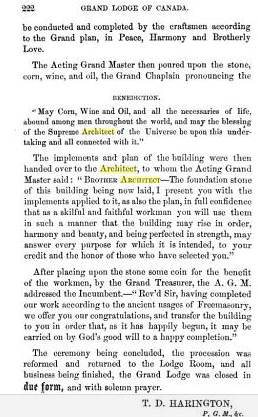 The ceremonies of laying the corner stone for these buildings were performed in full Masonic style, as outlined in this excerpt from the 1866 laying of the cornerstone of a church Fuller designed in Hull. An unusual and ritualistic ceremony that dates back to the time of the Templars. 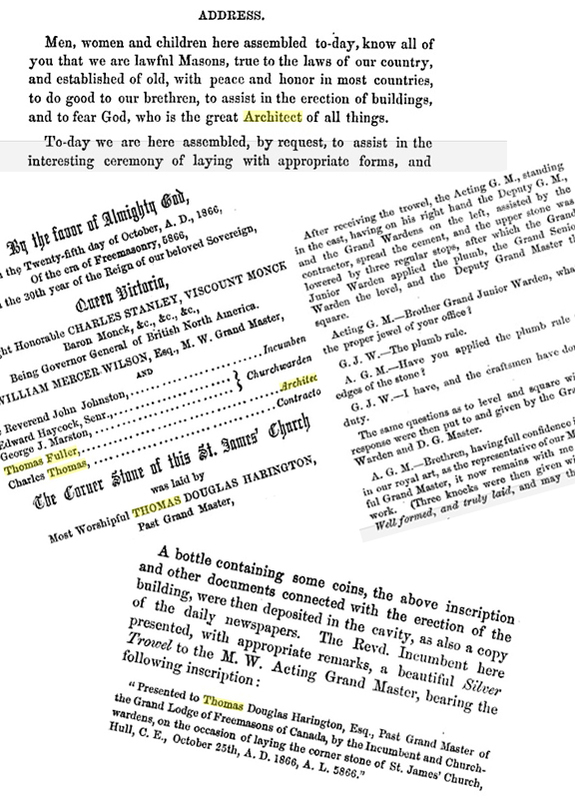 A record of the unusual Masonic rituals that accompanied the laying of the cornerstone for Fuller’s buildings…this one a church in 1866. 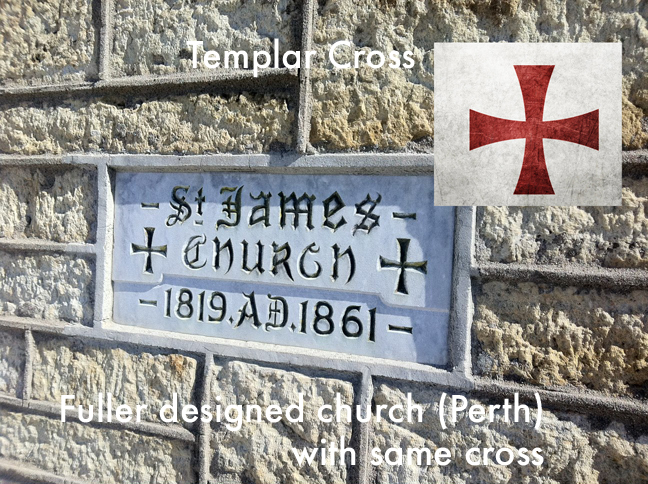 I leave it up to your own discretion and opinion, but I thought it would be interesting to compare what I think is a predominant Templar design style in Fuller’s buildings, an order he was associated with through his continuing work with the derivative Freemasons. The Parliament buildings originally designed by Fuller were destroyed by fire in 1916 with the only remaining example of his work being the Library of Parliament. It was opened on February 28, 1876, and its similarities to the Templar churches of medieval times seems just too similar to be just a coincidence. The original Temple Church in London, England (photo from late 1800s) built by the Templar Knights in 1180s in comparison to Ottawa’s Library of Parliament. Detail of the Library of Parliament. The Prince Of Wales, Albert Edward here seen in full Freemason attire. 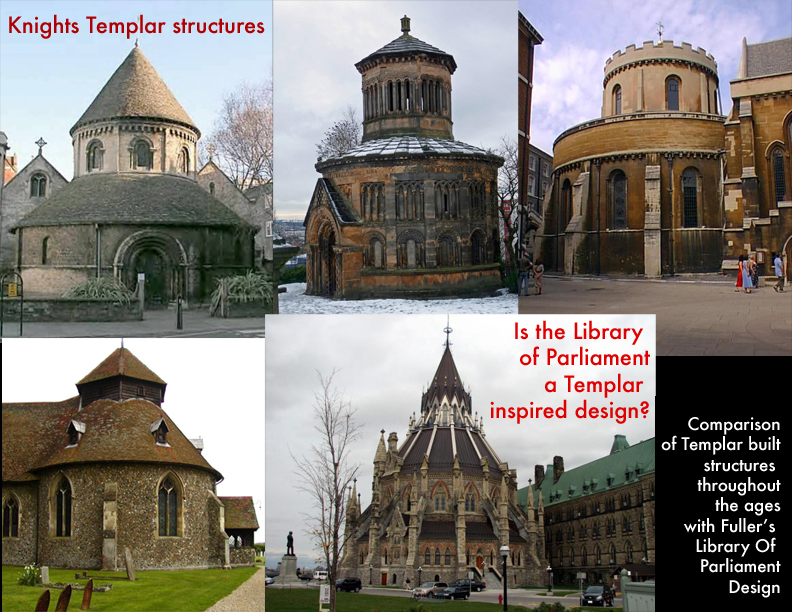 Templar architecture has a predominant rounded temple relating to their original Solomon’s Temple structure. This can also be found in the parliament buildings with the library building in the rear. Circular and buttressed walls are also similar in both designs. On September 1, 1860, The Prince Of Wales, Albert Edward, a known member of Freemasonry, presided over the Masonic ritual of laying the cornerstone of the Parliament Buildings. The Masonic Ceremony included The Prince Of Wales and Fuller exchanging Masonic vows while lowering the ceremonial stone. In 1875 Albert Edward became Grand Master of the Convent General of the Knights Templar. 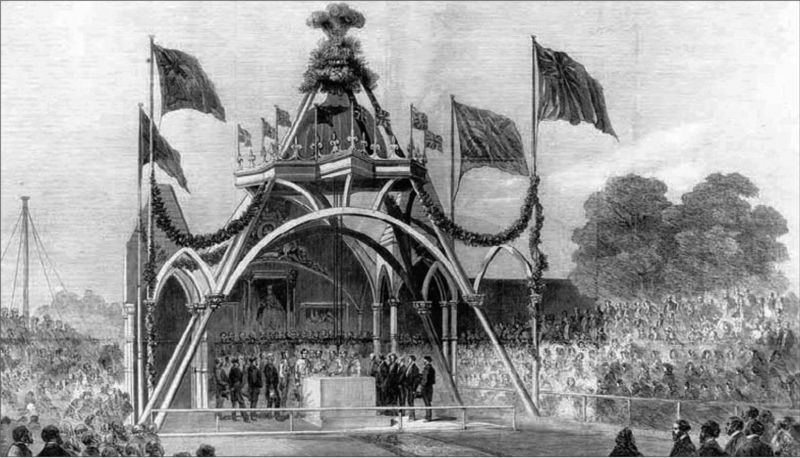 The cornerstone of the Parliament Buildings being laid under Freemason ceremony on Sept. 1, 1860 by Fuller and the Prince Of Wales, soon to be Grand Master Of The Convent General Knights Templar in 1875. Also, Fuller’s library structure is adorned in a “rose” motif, a symbol in both Templar and Freemason beliefs often used in ceremonies and rituals. The rose was anciently a symbol of Dawn, of the resurrection of Light and the renewal of life. In the Scottish Rite of Masonry the rose has special connections where the rose has taken on the meaning of immortality. 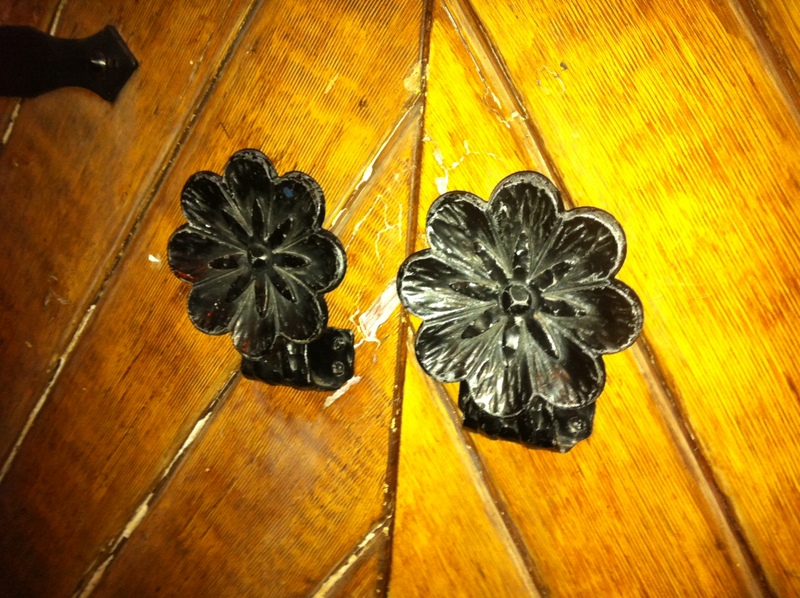 Detail of the 4 petal rose symbol seen around Parliament, including the door handles. 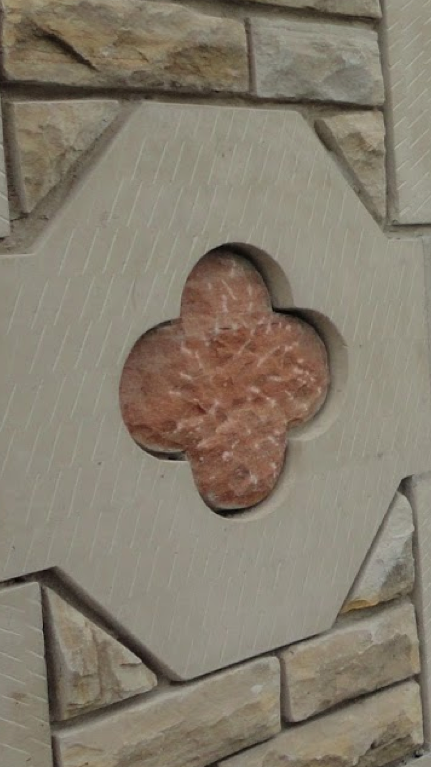 The rose carved into every window of the library is a four-petalled rose, like the Templar cross, a cross of equal lengths to denote balance. The Templar cross can also be seen in the space between the petals. 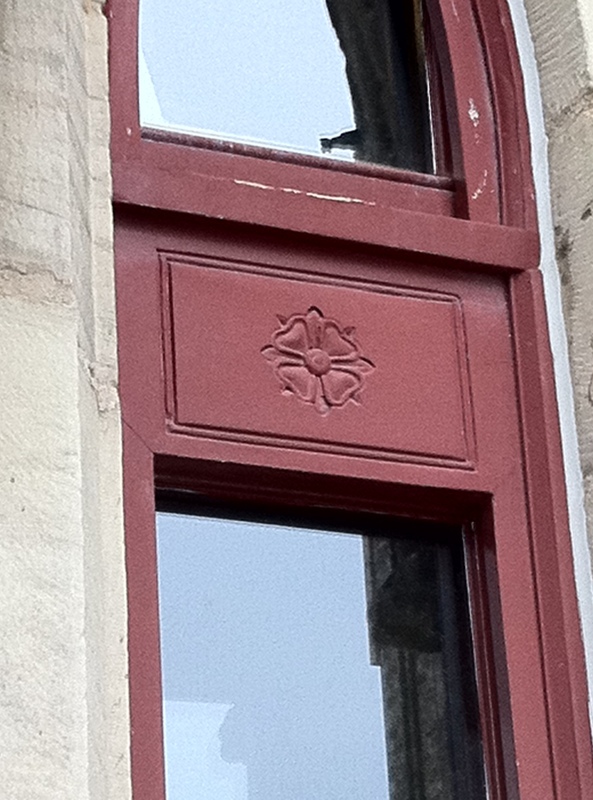 Every window of the Library is emblazoned with the symbol of the 4 petal rose. 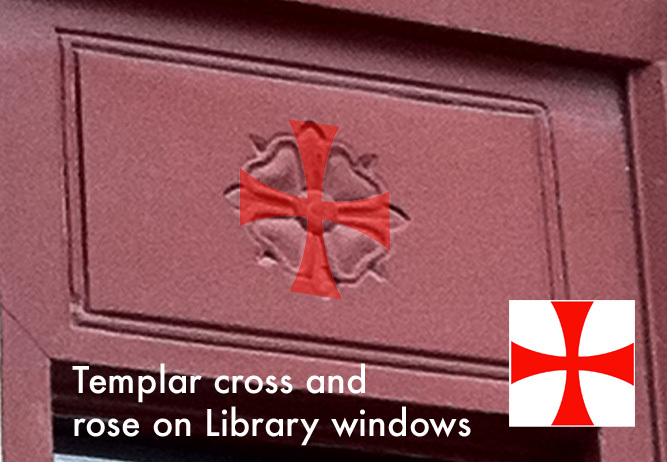 Note the hidden Templar cross that sits perfectly in the negative space of the rose symbol on the Library. 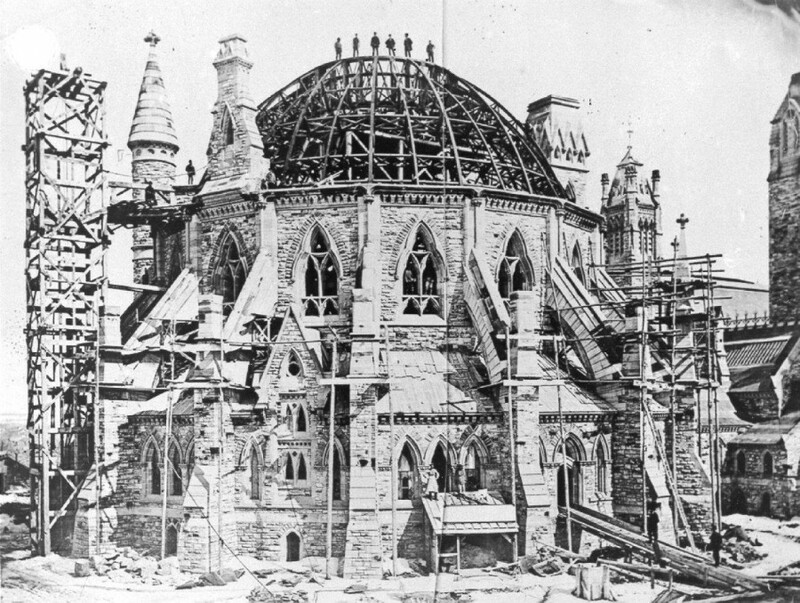 In an interesting continuance of the Fuller legacy, Thomas Fuller’s great grandson, William Fuller of Thomas Fuller Contracting Ltd. was awarded the contract to restore the Library of Parliament in 2002. Built by Fuller as a garrison church, or military defensive building in 1861, the side walls were prominently buttressed for added strength and a tunnel was constructed to connect the church to the adjacent Court House. 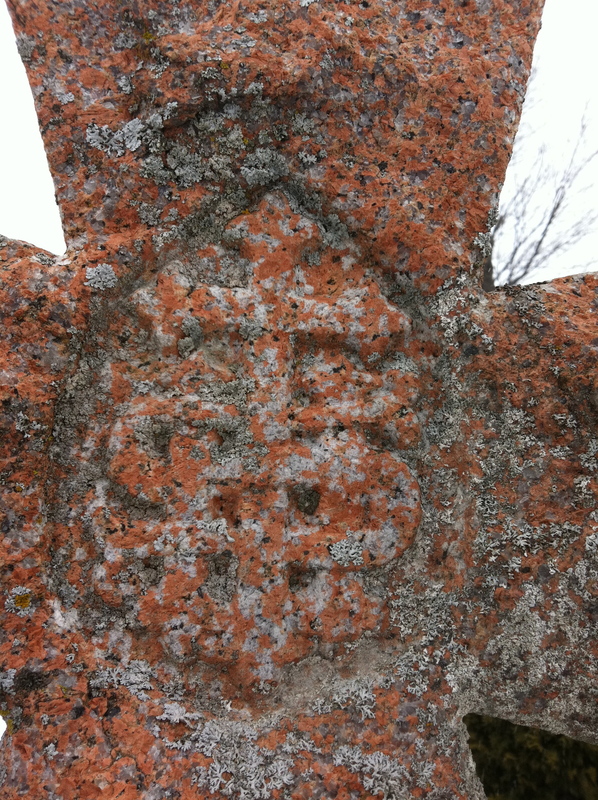 The cornerstone has the Knights Templar cross inscribed with the date. The church is designed in typical Fuller fashion, buttressed walls, low roofline and medieval castle style details, such as the elongated “arrow loop” windows. Fuller’s chracteristic medival Templar style on the Perth church. 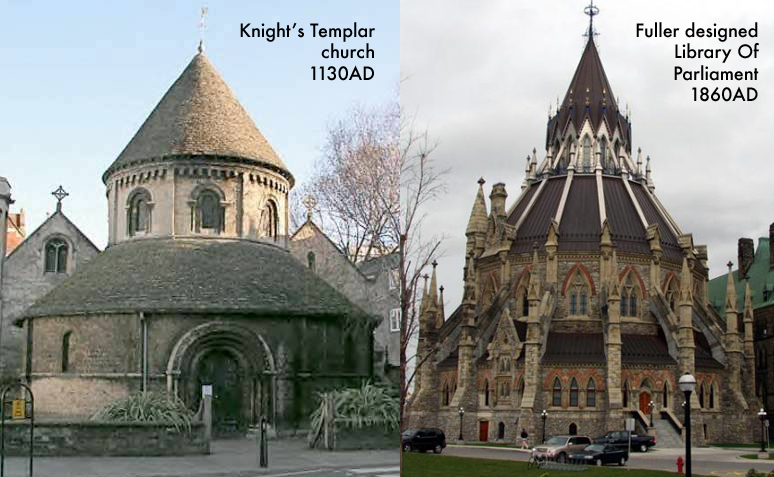 Comparison of Fuller’s Westboro church to a Templar church. Fuller designed these churches all at the same time in his signature style paying homage to the English medieval churches he was fond of and used as inspiration for much of his work. Rose door handles of Westboro church. Medieval castle features such as arrow slits were implemented in his church designs as tall, thin windows. Low rooflines and buttressed side walls were used in all designs. The structures also contain many rose motifs. From 1881 to 1896, Fuller was appointed Chief Dominion Architect for the Government of Canada, during which time he played a role in the design and construction of every major federal building. 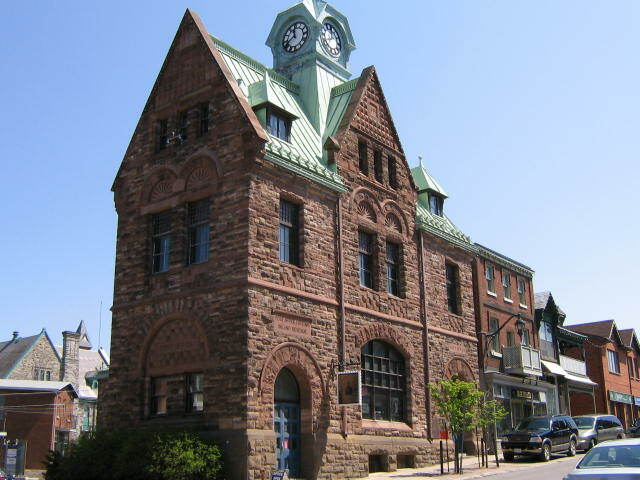 A Fuller designed Post Office in Almonte, ON. The Minister of Public Works appointed Fuller Dominion Chief Architect. He wanted high design standards and to create an imposing government presence across the country. Fuller excelled in the design of small to medium sized public buildings tailored to individual sites, perhaps best seen in the smaller individually designed post offices. Now cherished community landmarks these picturesque structures, sometimes asymmetrically designed, often feature a blend of Gothic and medieval elements. This work can be seen in almost every town and city in Canada through post offices and court houses built in this time period. Fuller witnessed the construction of approximately 140 buildings nationwide, of these approximately 78 were federal buildings and post offices. These buildings created and consolidated a federal government presence across Canada in a unified and distinct style. After studying the architecture of Fuller, I thought it would be best to confirm whether or not there was a Templar connection at his final resting place. 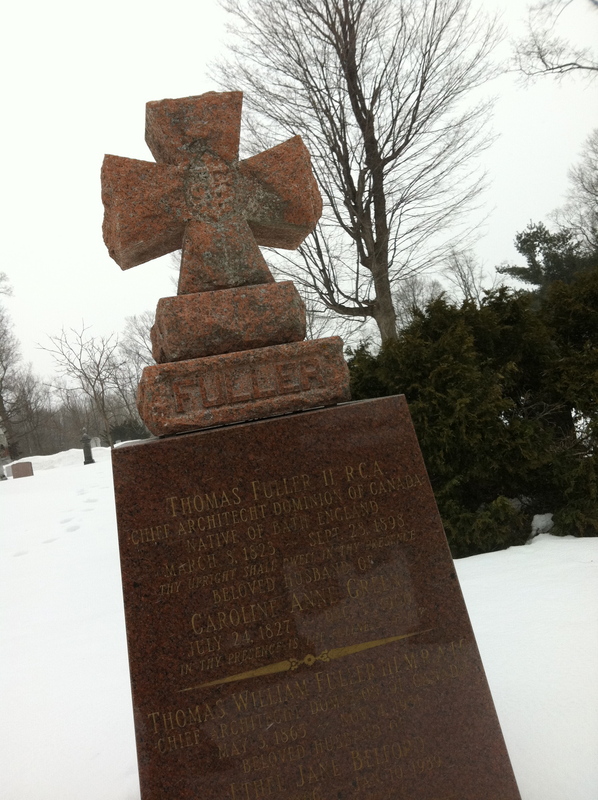 Thomas Fuller died in 1898 and was interred in Beechwood Cemetery here in Ottawa. Through the help of the cemetery staff who brought up historical records and kindly provided me with a map, I located where Fuller was buried. If Fuller was indeed part of the Freemason or Templar movement, his gravestone would most likely have a symbol of that association inscribed upon it. Trudging through the snow I finally came upon his grave and sure enough, there above his name, was the Templar cross. Thomas Fuller’s gravestone monument in Beechwood Cemetery. Inside the cross was an unusual symbol. The symbol of “IHS” in the centre of the cross. 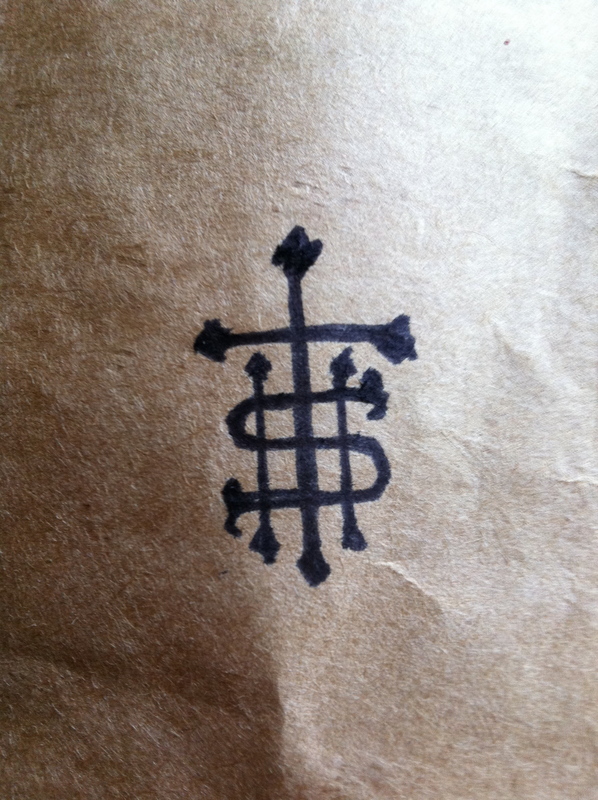 I made a clearer sketch of the symbol to help determine what it meant. Sketching the symbol out it was later determined that it was the symbol of the letters “IHS”.Asking for help identifying this symbol through Twitter and researching the letters IHS and the Freemason/Templars, it was determined from the Grand Lodge of Freemasonry Symbology website that it stands for “In Hoc Signo”, or translated, “By this sign you shall conquer” …. The motto of the Knights Templar. 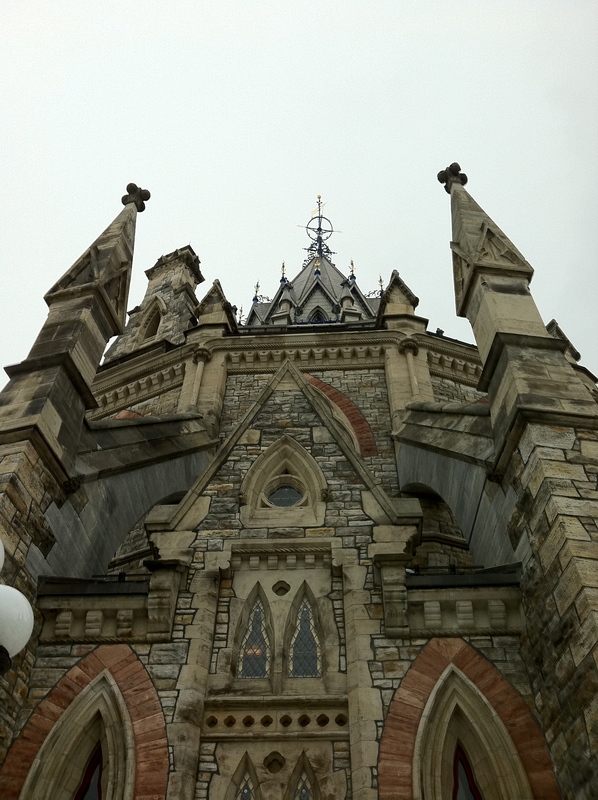 So there it was in plain site….The architect of Canada’s Parliament Buildings buried under the Templar cross with their motto “By this sign you shall conquer”…and conquer he did…140 buildings across the country all designed by Fuller, a member of the ancient order of Knights Templar. 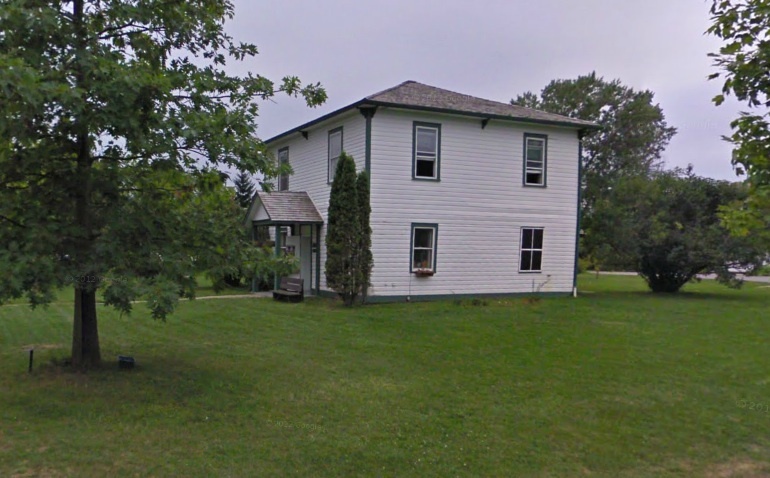 Countless courthouses and post offices in small towns across Canada are of his design. Next time you happen to see a stately building in your travels, look for clues to a Fuller/Templar connection and enjoy the stately architecture he so carefully brought forth from the days of the ancient Order. Comparison of the Templar IHS motto symbol in the rose cross shape and the symbol in Fuller’s work. Please note: The opinions and ideas expressed above are based on my own observations and are not meant to be used as academic fact. They are presented as theory based on compelling evidence gathered from my personal research and study. When you think about old forts in the area, you usually think of Fort Henry in Kingston, but there is a much older fort, and its remnants lie under the waves just an hour away. While doing some research on another topic I came across an excerpt from a 1876 book on forts. 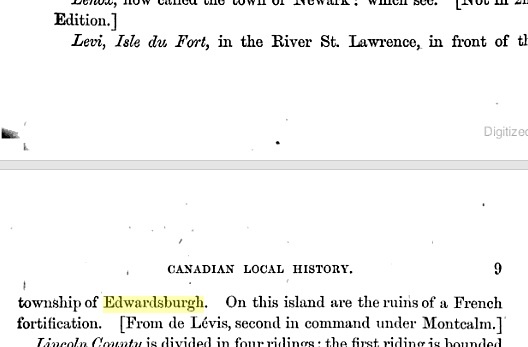 The old book mentions ruins of a fort called “Fort Levis” near Prescott. Excerpt from 1876 book mentioning ruins of a Fort near Prescott. Flooded out in the 1950s, Chimney island was once Isle Royale. Called “Isle Royale” by the French in 1759, a decision was made to build a fortification on the 800 foot island in the middle of the St. Lawrence to repel any invading British ships making their way up the river from Kingston. Abandoning a previous fort near Ogdensburg the French built the island fortress as a last ditch effort against the advancing British ships trying to take Montreal. 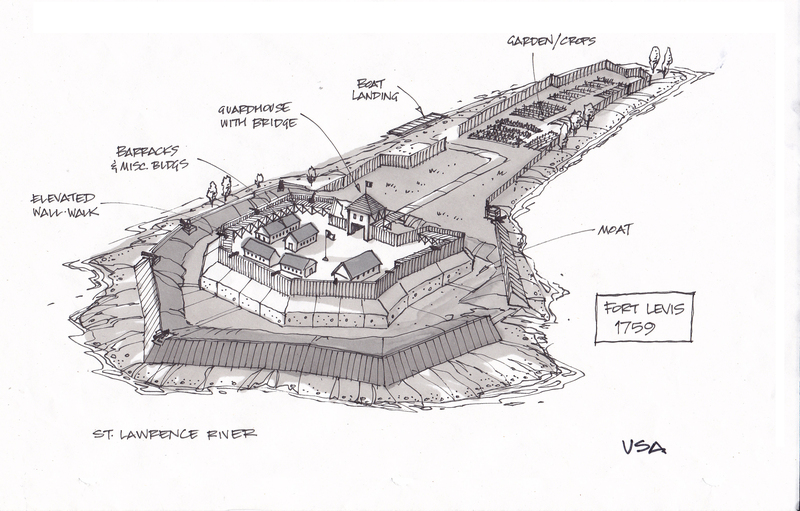 Armed with cannons, a moat, ramparts, palisades and other fortress features, it was called FORT LEVIS. The island army even grew a their own vegetables in a garden on the east end of the island. A French map from 1759 indicates Isle Royale and Fort Levis built upon it. Originally to be built of stone, plans changed due to time restraints and Fort Levis was built out of wood and measured about 350 square with bastions in each of the corners. 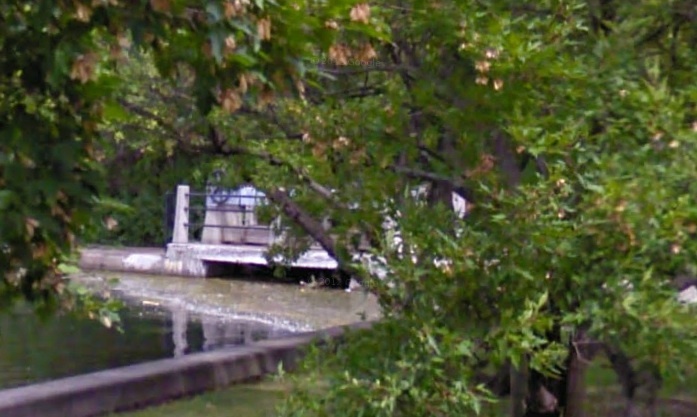 A loading dock area for supplies was on the north shore facing the Canadian side of the river. French Commander Pierre Pouchot took command of the island fort and prepared to defend what was soon to be a short lived fortress. 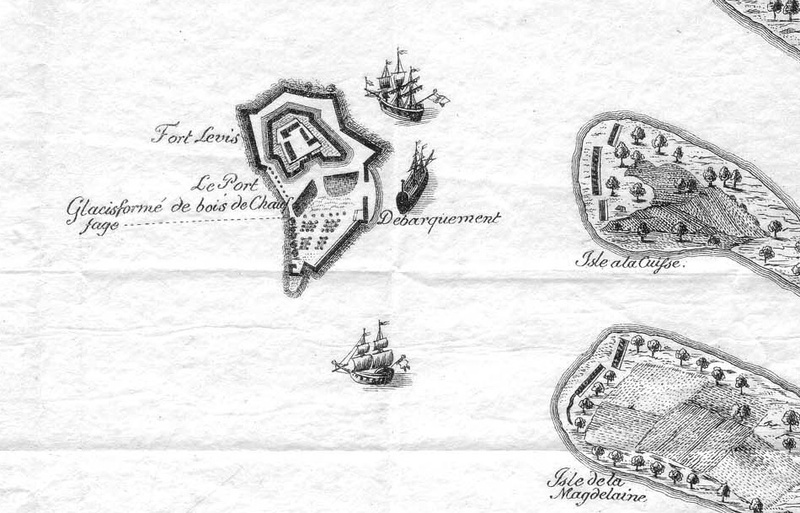 Sketch showing the island as it appeared in 1759 with the defensive features of Fort Levis. 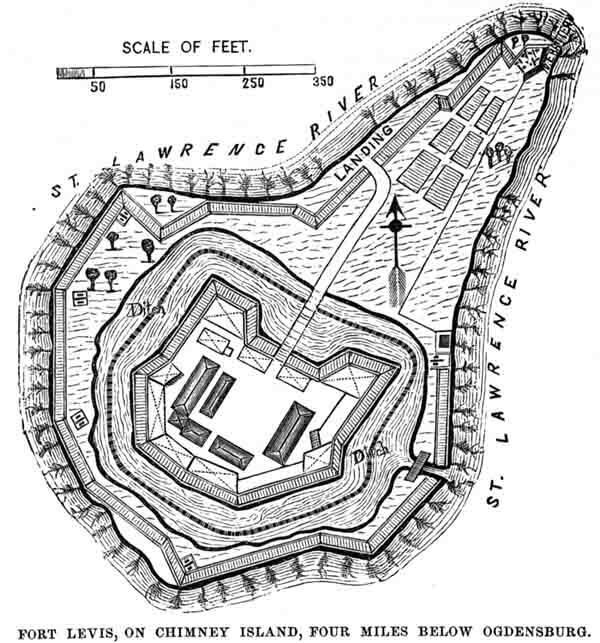 It didn’t take the British long to begin their advance up the St. Lawrence River in their gunboats towards capturing Montreal so the fort was put into immediate action. French lookouts near Alexandria Bay saw two approaching British gunships, the Mohawk and Onondaga, and raced back to the fort and braced for impending attack. British gunships, Mohawk and Onondaga advanced up the St. Lawrence through the 1000 Islands towards Fort Levis. The two British ships got lost in the maze of the Thousands Islands for a week, giving the French time to prepare for battle. 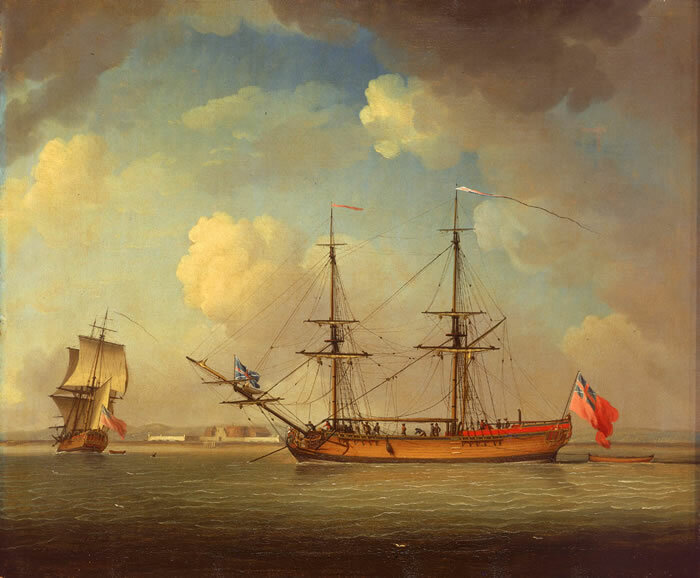 The British ships managed to capture a French gunboat along the way, hoisting a British flag and re-naming it the Williamson and adding it to its fleet of now three ships to take on the newly constructed Fort Levis ahead. Surrounding the island fortress were other islands, now held by the British with cannons stationed and aimed at the French fort. Under the command of Major-General Amherst, the three British ships arrived at Fort Levis on August 19 1760 and a fierce Battle Of The Thousand Islands began. The island fortress threw everything it had against the looming British trio of ships, blasting the newly captured Williamson 48 times with cannon fire. Amherst called a ceasefire and retreated for the night. At dawn the fort once again rained cannon fire upon the British ships while also repelling invading troops trying to storm the shores of the island. 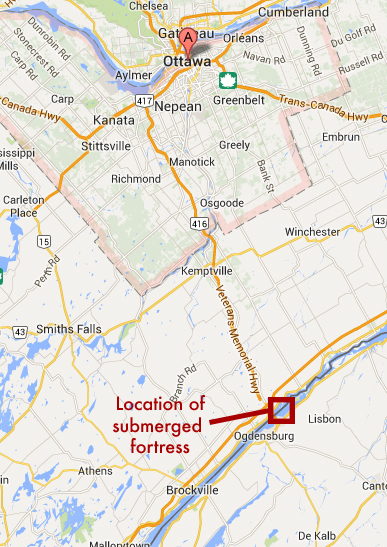 During the skirmish the fort managed to sink both the Williamson and the Onondaga to the bottom of the St. Lawrence. The island fort did not let up its defensive attack and Commander Pouchot pummeled the remaining ship, the Mohawk, with cannon fire, sinking it also. Three ships sunk. The British had nothing left to attack the fort with except their island cannons surrounding Fort Levis. Surprised at the unbelievable tenacity of the island fort to protect itself from all angles, Amherst gave the go-ahead to switch the cannons to “hotshot”, balls of fire that would set ablaze whatever they impacted. British hotshot rained down on Fort Levis, and with the fort on fire and having exhausted all their ammo, Pouchot finally surrendered the besieged island to the British. Originally armed with 300 soldiers, the French lost 275 men during the battle. The British lost 26 men. The fierce week long island battle was to be a decisive and final fight between French & British troops on the continent. 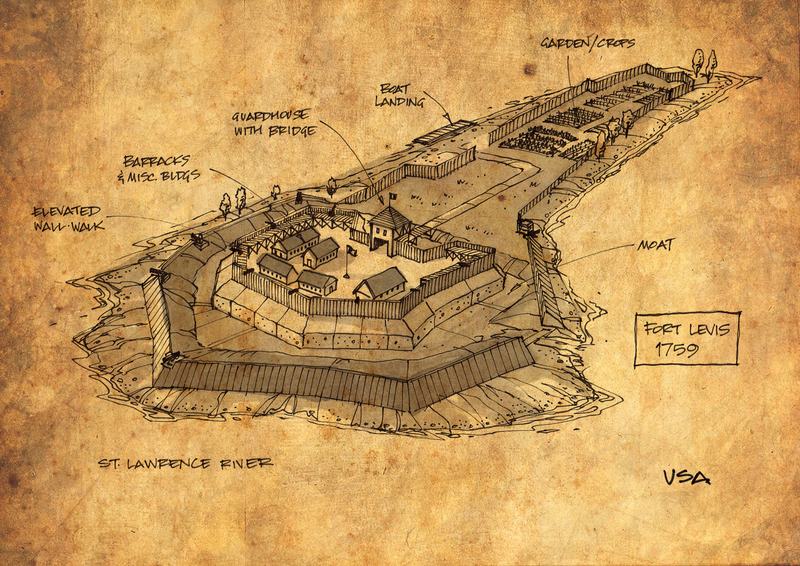 The island fort was rebuilt and renamed Fort William Augustus under the British, with Amherst carrying on to join other British troops that surrounded Montreal. On September 6, 1760 Montréal was surrendered by New France’s governor, the Marquis de Vaudreuil which brought an end to the French empire in Canada. The island fort was the last stronghold for the French and its loss to the British signaled the end to the war. It is unclear what happened to the fort between 1760 and 1950 when the St. Lawrence Seaway began construction. A study of aerial images produced in 1954 reveals the outline of the fort ruins were still visible on the island before it was submerged. Whatever remained of the original fort slowly slipped underwater in 1959 when flood waters raised levels for the new seaway. Comparison of the island fortress then and now. 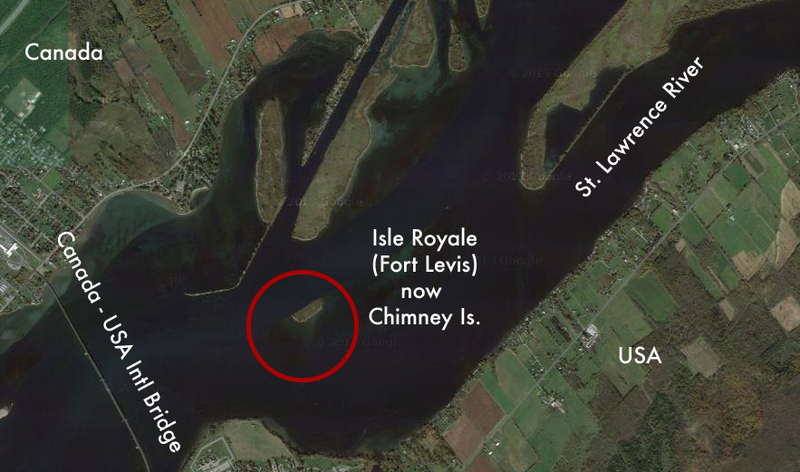 All that remains today of this important and decisive piece of Canadian history is a small patch of rock and grass now called Chimney Island which can be seen just east of the Prescott International Bridge. Whatever remnants of this 250 year old island fortress and its fierce past now rests quietly under the waves of the St. Lawrence River.